Dual F Coupler Wall Plate. Mounting Hardware included. Size : 2.75 x 4.5"
F Coupler /RJ11 Wall Plate. Mounting Hardware included. Color available: White. Looking for high quality Wall Plates? 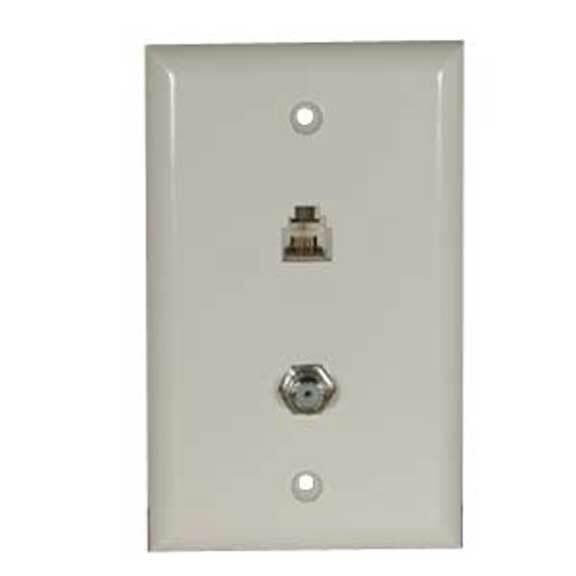 SF Cable is your one stop shop that provides all kinds of Wall Plates online. Find the right Wall Plates for your home. Add style to your living space with quality wall plates from SF Cable. Find blank wall plate for F Coupler, Dual F Coupler Wall Plate, F Coupler Wall Plate and many more in this section of our store. We provide all these wall plates at competitive prices. Wall plates we provide are RoHS compliant and environment friendly. Buy wall plates from us now and you will never have to complain.